Organic Arches (Time Traveler) is conceived as a metaphorical tunnel in space and time. The floating arches evoke a journey—part experience, part memory, and part imagination—in and out of the body, which artist Chico MacMurtrie likens to an “abduction” by an alien force. MacMurtrie, who grew up on the U.S.-Mexico border in Bisbee, Arizona, creates kinetic sculptures and installations that give physical form to the idea of transformation and human-nonhuman hybrids. With each cycle of movement, the Organic Arches marks the passage of time while generating an ever-changing spatial environment. Formlessness becomes geometric form and reverts once again to formlessness. This movement is Inspired by organic processes, from birth to death and rebirth, and by a regard for nonhuman agency. Organic Arches represents neither spacecraft nor a body, but an abstract living system and a vessel of memory. 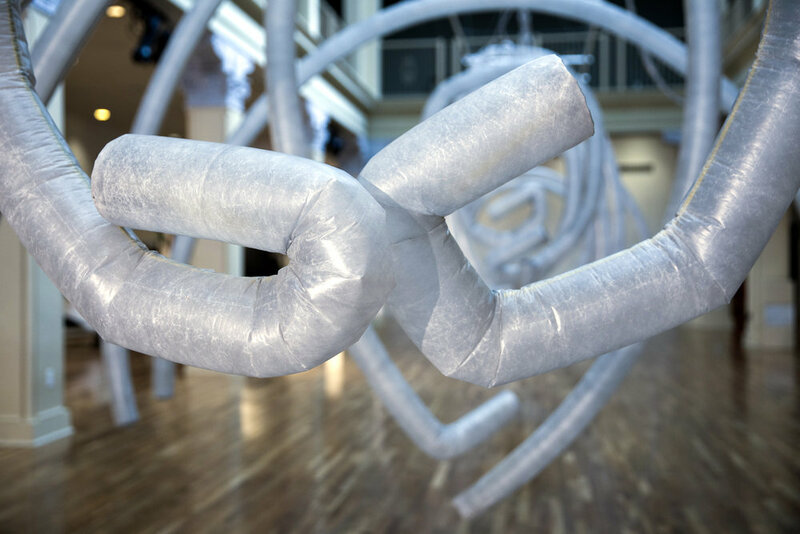 The 16 arches that compose the installation are made of high-tensile fabric. 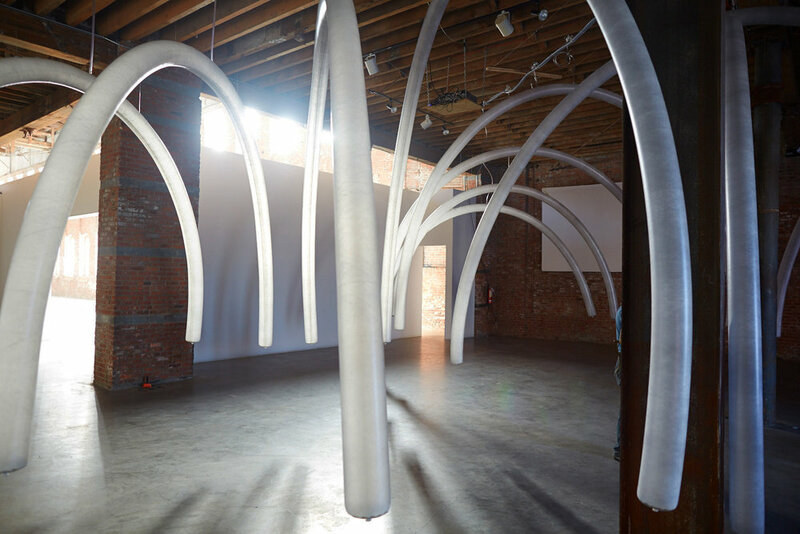 Suspended from the ceiling, the arches gain coherent form as they fill slowly with air. Then, as air begins to leave the vessel, it displays a transitional architecture. 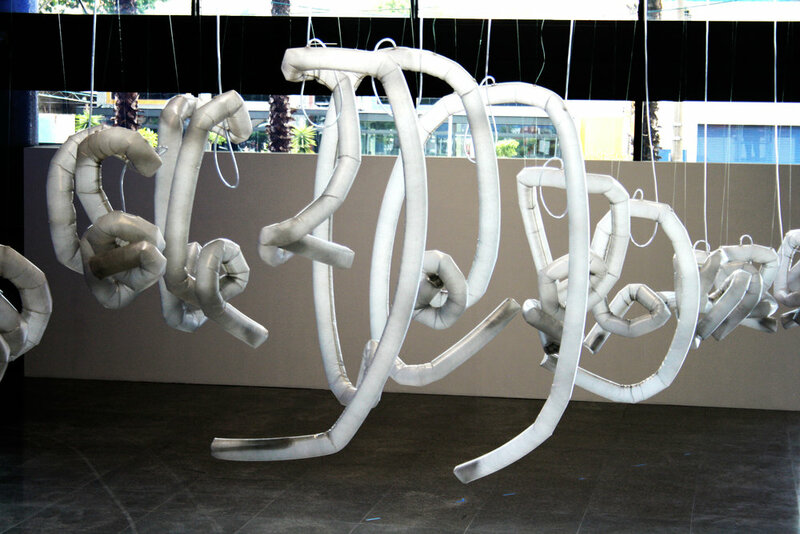 The arches coil into organic-looking shapes that suggest molecular structures, the building blocks of matter and life. These suggest the awakening of a living system or the onset of a new state. Finally the collapsed arches retreat into the abstract sign language of a computer-controlled organism. This choreography of programmed and arbitrary activity allows perception to overlap with mental projections and memories. The kinetic live environment defies expectations for a fixed object or form, leaving only the sense of bodily suspension and the presence of other organic, if not necessarily earthly, living systems. 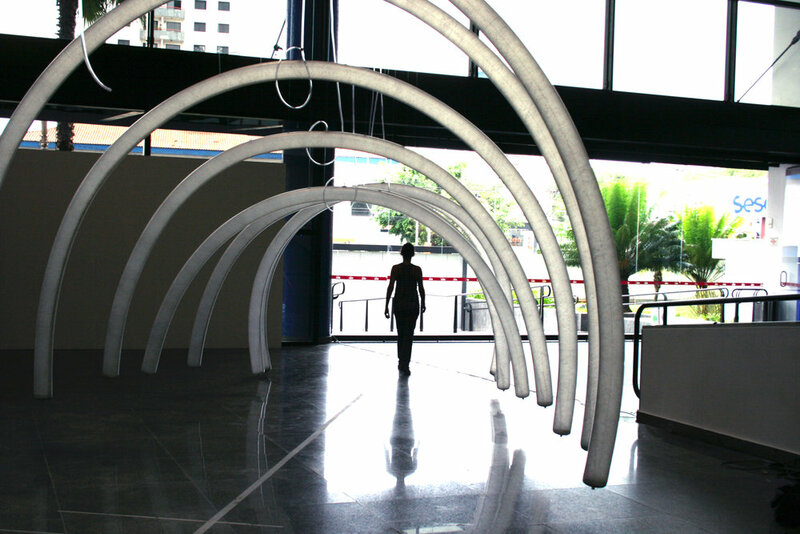 Organic Arches was co-produced with SESC SP, Automatica and Molior in 2014 and presented at SESC Santana in Sao Paulo, Brazil.